A perfect pair of beauty queens to decorate your mantle, sideboard or your favorite shelf ! Each is a multi piece construction solid bronze example, featuring two classical woman holding six light candelabra. On an almost daily basis. so don’t miss out! 4” wide 2 1/2” high Great for push up candleholders, chimney etc. Wear typical of age and use to finish. Prongs are there it will just need replacing. Sold as found. With onyx marble base. 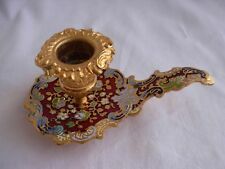 gorgeous French Candle holder. decorated with caryatids / winged ladies at the sides and lion heads. 56 cm height and 20 cm wide on top. As you can see, this candle holder has five arms, and thus, can accommodate 5 candles. Because the marble is black, it is difficult to see, but I wanted you to be aware of it. That being said, this piece would certainly make a lovely addition to your table, mantle or shelf. I do not know the age. By Bjørn Sigurd Ostern for David Andersen. Mid-Century modern sterling silver candelabra. Contains 32.75 troy ounces of 925 sterling silver. (RECEIVE WHAT YOU SEE) ! Slight variations between the two Putti, but almost identical, one base is slightly. r eplaced and are contemporary but t he bronze Putti are 19th century. The marble bases and gilt bronze candle holders are have been. Grapes & leaves base, floral top. Good luck! Nice tall (19") brass candlestick. There was a handwritten price "165 pr.". No further information. It is solid, well made, but I don't know whether it is a reproduction. One of these was in a trunk that hadn't been opened for 30 years or more, and it was not bought new. This is a pair of weighted sterling silver Salt and Pepper Shakers. Details below. So, if that vase or trinket or bowl ever loses my interest, I know it'll still be worth that base value--PLUS whatever artistic value it has. Beautiful Hand Chased Foliate Scroll Design. Silver on Copper. Marked Christofle. Weight 14oz. Condition: Very good condition with surface marks consistent with noticeable use and wear. Light scratches and light oxidation to the surface. Designed with a vine and a butterfly, these candlestick holders are in EXCELLENT Condition. There is minor wear present. There are no breaks, bends, or repairs. Local pickup is accepted. This is a Pair of Glass Candle Holders. Each Holds two Candles. These are Clear Glass Candlestick Holders. The one holder has a very small rough spot present. Cc rnnn A22 1189 1299. Also have a French style. They are marked Syroco made in U.S.A. They are a thick resin type of material as is all syroco products that highly resembles a carved wood look. They are in a darker gold tone but could easily be painted any color of your choosing. A PAIR OF ANTIQUE FRENCH BRONZE CANDLESTICKS,LOTUS LEAVES PATTERN,ART NOUVEAU. IT S IN VERY GOOD CONDITION,WITHOUT CRACK,DEFORMATION OR OTHER PROBLEM. 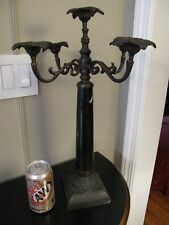 Up for sale is a brass cherub candlestick with what looks like a bronze finish. It is in very good condition, no breaks or repairs. They are both in very good condition with minimal wear present. Very clean and with nary a scratch on it and still with its affixed maker's label ribbon decal on its sidewall. There's a very small scuff on the sidewall and what appears to be a few very small areas of discoloration, which are slightly darker spots. WE USE FOR 95% ORGANIC / RECYCLED MATERIALS. From Door to Door. CANDLESTICK / CENTERPIECE / BOWL. The centerpiece with candlestick and very fine detail. France cca 1890. This is a pair of weighted sterling silver candlesticks. Details below. Weight: 285 grams total. In general, these sizes of candlesticks usually bring around an ounce of sterling in every pair. Current Spot Price: 51 cents / gram. Age - circa 1757 - 1802. Kept in the attic of a mansion for decades. I AM NOT AN EXPERT IN THIS FIELD. The piece is HEAVY and very ornate. This is a very rare and unusual, Vintage, Mid century Modern Teak "spinning" candelabra. The works are made by Reuge Musical Muvement and it plays Doctor Zhivago, Lara's Theme. It measures 4 3/4" tall x 7 1/4" across. The candles are 5/8" across (I think this is smaller than a regular taper candle). The music box plays (there is a side off/on lever) it is wound by moving the candle around the base. It seems to be VERY finiky, and does not seem to play for very long and sometimes not at all. At other times it plays only a note or two. So we are selling this as is, as Im not sure what it wrong with it. I can not seem to find another one like it. It is very rare and quite unusual. Height: approx. You buy only what you see. These are finely crafted and of the most refined 19th c. design and most likely French in origin. LION ENGRAVED IN DISH NEAR SNUFFER HOLDER. 3" HIGH (NOT INCLUDING SNUFFER). MARKED ON BOTTOM: S SMITH, KING ST, COVENT GARDEN. 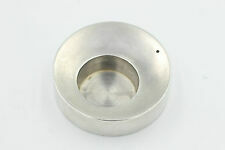 IN ANTIQUE USED CONDITION NO DINGS DENTS TO (CHAMBERSTICK)SHOWS WEAR TO THE SILVER PLATE (SEE PICTURES).